Material: PP Plastic+ zinc galvanized steel. WEBI New Design Plastic Clamp Beach Towel Clips Chair Clips are great for holding down towels,clothes,curtains,photo studio,curtains,fabric,easel,woodworking,backdrops.It can help you a lot in you life in a lot of aspects. Keep your clothes,quilt,Blanket on the clothes line. Perfect for holding down your curtain when you want to open windows. 【LARGE DIMENSION】: 6.7''L*3.7''W*1''H, Can be opened up to 6.7 inch, secure your items to the frame of most chairs,clothes Lines with rounded jaws. 【DURABLE & STRONG】: WEBI Beach Towel Clips Contain Double Springs,made of zinc galvanized steel- rust resistant.Compared to the Clips which only own one Spring,Our Clamps is more sturdy and can provide more power . 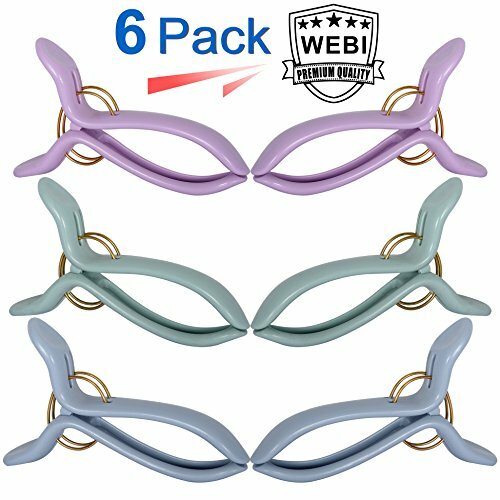 【UNIVERSAL & HANDY】: Come with 6 Packs,3 colors:Green,Light Blue,Purple,2 clamps for one color,WEBI New Design Towel Clips Can Keep your Towel,Clothes,Blanket,Quilt from Blowing Away,What is more,Our clamps can be used for photo studio,curtains,fabric,easel,woodworking,backdrops. 【ANTI-SCRATCH & FADELESS】: Made of durable PP plastic instead of metal,less chance of scratching your items.What is more,the color of our Clamps' surface are fade-resistant in all weather.